The first poster for this fall's The Social Network has been released. More commonly known as "the Facebook movie," the film chronicles the early history of the most influential social networking site. 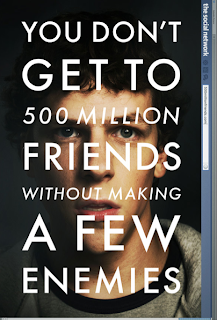 The above poster depicts Jesse Eisenberg (portraying Facebook founder Mark Zukerberg) with the tagline, "You don't get to 500 million friends without making a few enemies." 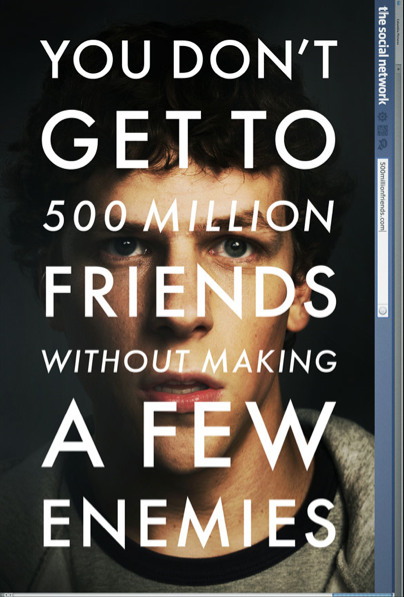 The cultural relevance of Facebook has grown so enormously that the idea for this movie fails to shock me. Facebook is now a prime communication tool and has more hits than Google. Forget MySpace - Facebook led the social media revolution. I'll be checking out the film when it hits theaters in October. What do you think of the premise of the film - is it something that you're itching to see?